I grabbed this tank to have a quick look but I didn’t have a chance to try it on and I don’t really like it for me anyways. If your looking for a tummy hiding loose fitting wicking top than I think this is a good idea. It came in a few colors (river rock, lolo, senorita pink) and this is the Static Charcoal which was the nicest one I thought. 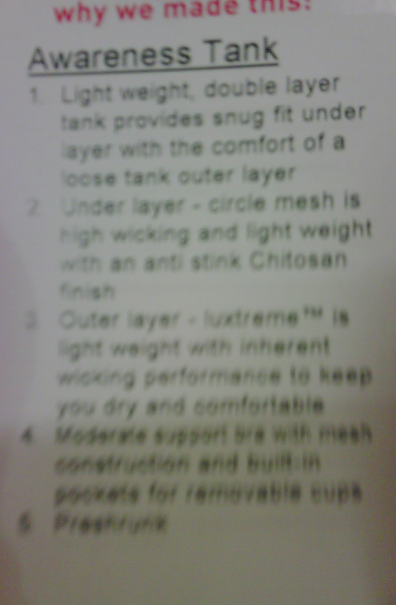 The bottom few items in the hang tag are blurry but they state that it’s a moderate support tank with built in cups. The price was $68!!! shocking. 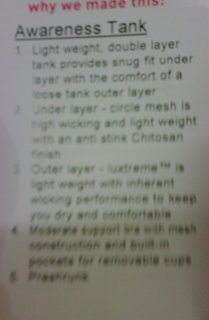 its the same concept as the no limits tank, hopefully this isnt a replacement. 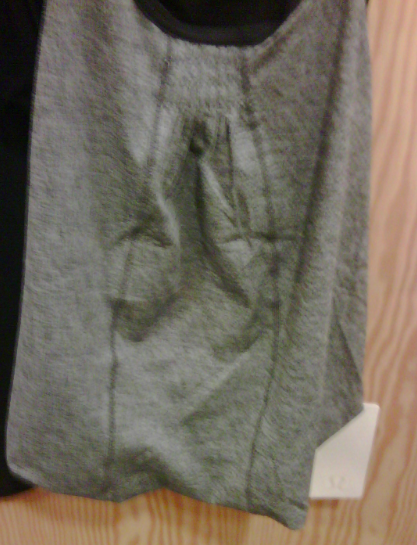 I tried this on and didn't like it at all! It looks like a bubble and you can pull the back layer open, it's very strange! yah sort of actually. The No Limit didn't really appeal to me either so it just depends on the sillouette you like I guess. Vicki, did the luxtreme feel extra thick to you? I thought it felt a bit thicker than usual. Very odd tank.